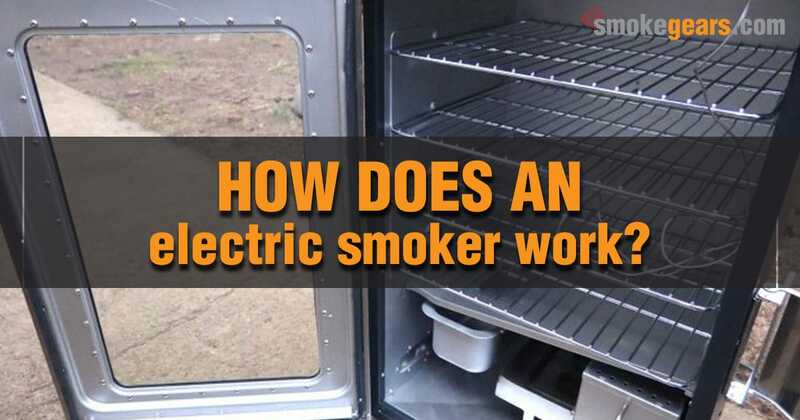 →How Does an Electric Smoker Work? One of the many questions you might be asking if you are contemplating to invest in a new smoker is ‘how does an electric smoker work?’ More and more people are investing in smokers for use at home. So, you definitely want to find the best electric smokers when the time comes to purchase one. But, understanding how they work, and how you are going to use your new smoker alongside the best wireless meat thermometer, is important if you want evenly smoked meat, and the best taste possible. In terms of how the smoker functions, it is typically started with the push-button or switch on your electric smoker. A digital control panel makes it extremely simple to use an electric smoker. You will find the temperature range (typically from 100 to 275 or 300 degrees F) right on the panel screen. Depending on what is being smoked, you can easily adjust and regulate temperatures on the digital panel. The walls of these smokers are also insulated, meaning heat retention is achieved. Therefore, you don't have to worry about over or under cooking while smoking meats. Most new smokers have a digital panel. Here you will choose the meat to be smoked and temperature. Thanks to the advanced technology, many of the smokers feature 24-hour timers. You can delay cook start times, you can set timers while smoking a particular type of meat, or you can choose the desired temperature based on how you want the meat to be prepared. Meat grinder reviews here. Every smoker is a little different, so you should familiarize yourself with the configurations and setting options prior to starting to use your new smoker. Most new model electric smokers are extremely spacious inside. They also have different racks/levels for you to smoke different kinds of meat. The beauty of this is that your smoker is intuitively designed. You simply select the type of meat, poultry, fish, or vegetables you are smoking, and the smoker will adjust for you. There are preset temperature ratings. You don't have to worry about over or under grilling. There's no need to continually open the door to add wood chips or other fuel. The smoker automatically adjusts the heat based on the chosen settings. Many new electric smokers allow you to adjust settings based on the desired taste and texture you prefer as well. For example, if you prefer milder flavors while smoking, an adjustable air damper which is found on most devices helps increase air smoke levels to achieve that desired taste and texture. The same goes if you prefer a more robust taste. Simply leave the air damper closed, for the smokier and richer taste while smoking a specific cut of meat. It’s obvious that no two electric smokers are alike. So, it is important for you to understand the features, as well as the adjustment options which are available with different models. This will help you find the best one for your personal preferences and taste. Although electric smokers eliminate the need for you to continually check the temperatures and stay on top of the foods you are smoking, many do have a wood tray panel for you to add wood chips if chosen. Using this feature will allow you to add a richer taste and texture to the meats you are smoking. Even with these chip trays, the smoker does have the internal configuration setting. It will automatically adjust the smoking times and temperatures for you. There is virtually no guesswork with using the smoker. As long as you choose the specific cut or type of meat you are smoking, it will automatically adjust, making your life easier. And this, in turn, ensures a more enjoyable taste regardless of what foods you plan on placing in the smoker. It is important to bear in mind that not all electric smokers have the temperature adjustment option. This is one of the drawbacks you should consider while choosing a smoker. Due to the fact that it relies on thermal energy and internal heating from the heating element, it automatically adjusts the temperature while smoking. Depending on the type of meat you have chosen, and the internal temperature it should be cooked at, the smoker is going to set that temperature. It will simply inform you via the alarm once the desired temperature has been reached. There really is no guesswork when it comes to smoking with an electric smoker. A switch or a pushdown button on the front, a large, easy to use and intuitive LCD display panel, and a few touch buttons on the front screen; and you are ready to go. Just choose the type of meat you are smoking, and the thermal heating element will do the rest of the work for you. There is no need to add water routinely into the drip pan, and no need to constantly turn the meat, rub it, or add water/seasoning to it, as you would do with a traditional smoker. Although there are a number of products you can choose from, an electric smoker is one which truly does remove the guesswork out of smoking meats. It makes it easy, error proof, and ensures even taste, and ideal internal temperature for any meat you are smoking. There are a couple drawbacks though. But the simplicity in design and ease of use, make it a great option for many grillers. For those who are pressed for time, do not want to do the heavy lifting on their own, and want something seamless for smoking, an electric smoker is an ideal solution. The best grillers know that the right tools make the best grilled meat, texture, and taste. Alongside the best thermometer for smoker, you should have the right electric smoker. So, when the time comes to invest in a new smoker, consider the ease of use, and the type of meat you will be smoking, and overall functionality of your new smoker. Doing so not only ensures a pleasant experience with the quality of your smoker but also the desired taste every time you fire it up.